The Appian Fund struggled during an eventful October returning –2.91%. Manager performance across the Wilshire Platform was challenged, and the Fund’s lone positive performer was Long/Short Equity, which outperformed the broader equity markets. Significant drawdowns by the Fund’s two Event Driven (“ED”) managers combined with similar performance from the Relative Value Arbitrage manager produced a disappointing month for The Appian Fund. October was turbulent for markets, which sold off heavily in the first half of the month before bouncing back quickly in the second half. Stock markets were initially dragged lower on fears of a global slowdown after the International Monetary Fund cut the global growth outlook and on poor European and Japanese economic data that heightened concerns of deflation. Energy prices plummeted, dragging cyclical commodity sectors lower. Volatility, as measured by the S&P 500 VIX, fluctuated in October beginning the month at 16.71 and ending at 14.03. Spikes intra-month drove the reading as high as 25.27 midmonth. However, momentum shifted mid-month as the beginning of the ECB’s bond buying stimulus program combined with dovish Fed comments to reverse the negative sentiment. Expectations of solid U.S. corporate earnings coupled with a strong GDP print saw U.S. stocks rebound to finish the month higher. The U.S. dollar continued to make gains versus the rest of the world, propelled by the divergent outlook for growth and monetary policy. To close out the month, the Bank of Japan unexpectedly boosted its own stimulus measures, which accelerated purchases of bonds and domestic stocks and gave a further lift to global markets. The Fund’s Long Short Equity manager had a strong October, sparing the Appian Fund from deeper losses. The Fund’s return in October was similar to the return of the S&P 500, which is impressive given that they are running the portfolio at 50-60% Net Exposure (Net Exposure = Long Exposure – Short Exposure). The Fund’s Relative Value Arbitrage manager, which is a long volatility strategy, disappointed for the second consecutive month. The Fund’s October loss was caused by the strong downturn in gold prices during the month. This caused a unidirectional move in the manager’s gold miners pair set. 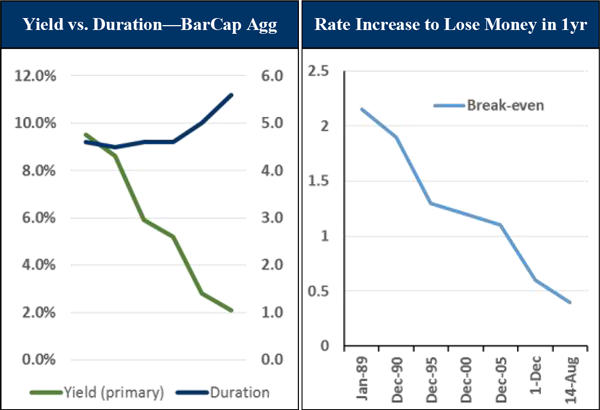 During drawdowns such as these, the strategy requires a 25% retraction to make back losses, which we expect will occur. The Fund’s two Event Driven managers struggled in October. As with many ED managers, the Appian Fund’s multistrategy ED found itself on the wrong side of the Shire/AbbVie cancelled merger. AbbVie was pursuing a takeover of Shire due primarily to tax reasons, but the U.S. Government’s pressure against tax inversion deals likely swayed AbbVie’s board from pursuing the transaction. On the positive side, the deal break widened spreads across all merger arbitrage deals, which is a positive development for their strategy on a go-forward basis. The Fund’s Event Driven – Special Situations manager suffered a significant drawdown in October as key European holdings suffered due to concerns about European growth and stability. This is the manager’s fourth consecutive month of negative returns, and they have weighed on the Appian Fund’s performance throughout 2014. Following the difficult October for the platform, we held an in-person meeting with Wilshire in which we discussed and debated each manager on the platform, name by name. Absolute returns were but one of the factors we discussed as other topics of discussion included returns relative to the strategy the manager pursues and level of risk taken, returns relative to peer group and organizational issues the managers may be facing. You may recall that in order to be on the Wilshire Platform, a manager must not only pass Wilshire’s due diligence initially, but also must continue to do so on an annual basis. Continuous monitoring of the managers is at the core of our relationship with Wilshire, and if they lose comfort with a manager, we lose comfort as well. This is the case with the Fund’s Event Driven – Special Situations manager. During the aforementioned drawdown, the firm underwent significant changes in its management. Poor returns combined with significant organizational changes is enough for Wilshire to fail a manager, and as such Wilshire removed this manager from the platform as of December 1. The Appian Fund’s 10% position in this manager was moved into Global Macro as of December 1. Although we have a checkered history with the platform’s Global Macro manager, they have performed well in 2014. After a three year performance period which could only be described as poor, it appears that they may have righted the ship, and Wilshire remains convicted in the firm and the strategy. Additionally, as we will describe below, the market environment that we are entering may be ideally suited for this type of manager. We appreciate your patience and are aware that the Fund’s performance has struggled in the past six months. We believe and expect that this is a temporary impairment that will soon be rectified. November was the first month of performance with the Fund’s significantly altered asset allocation, and we continue to have high conviction behind the investment strategy which underlies that allocation. The two reasons we have confidence in the go-forward portfolio are: (1) We have built the portfolio to have as little broad-market exposure as prudently possible, and (2) We believe the end of the Federal Reserve’s third Quantitative Easing program may later prove to be a turning point in the conditions of equity and fixed income markets and should bode well for hedge fund strategies in general. Let us examine this second point more closely. It is difficult to generalize the performance of a universe of 9,000 managers pursuing a wide variety of strategies. But if you did, you would conclude that in the past five years hedge funds have underperformed global equities and high yield bonds on an absolute basis and investment grade bonds on a risk-adjusted basis. Conventional asset classes have been supported by unconventional monetary policy, which has dampened volatility, removed risk from the market and prohibited price discovery. Our presence in Chicago provides us access to a great number of traders, Global Macro/CTA Funds and other market participants that pursue long volatility strategies. If you collected all of these people in a room and surveyed them you would find they are in high spirits because the Fed is finally “out of the way”. As unconventional monetary policy begins to unwind and the economic recovery continues, conventional assets are likely to become riskier. Let us illustrate this by examining the Barclays Aggregate Index. In this index duration has increased while yield has decreased; as a result, the degree of rate increase which will cause investors to lose principal is at a historic low. Interest rates can affect 90% of price movements within fixed income indices, and we believe they are asymmetrically positioned against investors. The 34-year secular bull market in interest rates appears to have run its course. As for hedge funds versus equities, hedge funds have historically performed well in periods of rising equity volatility and rising interest rates. This phenomenon holds true for periods before and after the global financial crisis. In summation, we acknowledge that 2014 has been a disappointing year for the Appian Fund and, again, we do appreciate your patience. As we look forward to 2015 we believe the portfolio is positioned ideally for a more normalized and potentially more volatile market environment. We hope you and your families had a nice Thanksgiving and we invite you to contact us at any time.